Asia Foundation for Help is involved in a wide range of services, which include eye camps, sending clothes to the needy in Asia, orgainising financial grants for people in emergencies and distress etc. 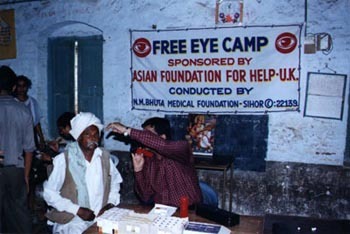 Asia Foundation for Help organises eye camps in villages of India that help thousands of individual in getting timely care. Apart from the eye camps, a more permanent solution in the form of Eye care center are also being formed like the one's at Mithapur, Zagadia etc. Clothes are sent to countries and people who are in distress. Financial grants are organised for needy and deserving students. Donations and other monitory help provided for people in emergency situations like flood famine, cyclone etc. 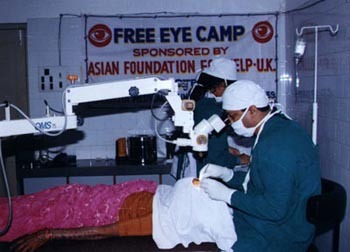 e.g £ 80,000 was donated for various causes during the 1988 famine in India. Ambulances and medical vans have been donated to a number of organizations to assist patients.